« Grab Pictures from Facebook While on JibJab! Go figure, on the day that Corey brings in her scruptious popcorn-peanut brownies, we also receive a HUMONGOUS candy bar in the mail from the peeps at Birthday Alert. To the uninitiated, Birthday Alert is a giant on Facebook, an application that over 800,000 people use daily. Take a look at the application and you’ll see that we’ve joined forces to ensure total Facebook birthday dominance! 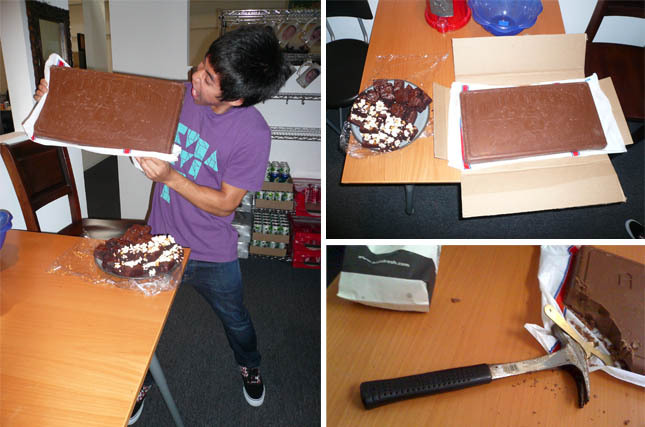 Anyways, back to the chocolate, which is so giant and hard, we could only eat it with a hammer and chisel. By the way, if you’re down in San Diego for Comic-Con this year, don’t forget to check out some JibJab artists that are manning personal booths full of neat artwork. You can get more information here and here! This entry was written by paulhanges and posted on July 24, 2009 at 4:27 pm and filed under Inside JibJab with tags Birthday Alert, Chocolate. Bookmark the permalink. Follow any comments here with the RSS feed for this post. Trackbacks are closed, but you can post a comment. Can I have a bite? Woah, that’s huge! Just wanted to say, I joined JibJab a couple of days ago, and have been making personalized videos and pictures. I haven’t had so much fun since I was a kid and My redheaded Aunt Dot used to reach up the leg of my sortpants to pull my shirttails down! Y’all are undercharging for joining!